The Christophe Mérieux Prize 2015 of the Institute of France was awarded to the professor and doctor Jean-Jacques Muyembe, director of the National Institute of Biomedical Research (INRB) of Kinshasa, DRC, for its internationally recognized research in the fight against Ebola. 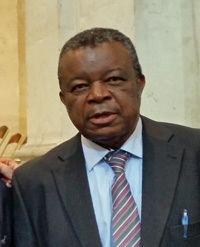 Dr. Muyembe Tamfum is a professor at the University of Kinshasa and director of the National Institute of Biomedical Research (INRB). He is also director of the Master Ecology of infectious diseases, natural hazards and risk management (ECOM-ALGER) created this year in the Democratic Republic of Congo, inspired by the master Ecosystems, contaminants, health (ECOS) of the University of Franche-Comté with the support of its staff. Dr. Muyembe is a pioneer in the fight against Ebola hemorrhagic fever. Present in 1976 with his team on the first outbreak site, he began by describing the clinical manifestations of the disease, from observations and late complications to the the epidemiological, virological and therapeutic aspects. He thus managed to develop specific and integrated measures to control Ebola, used since then to manage epidemics in Africa. Jean-Jacques Muyembe also experimented transfusion Ebola convalescent blood of 8 patients, making it possible to treat 7 and thus constituting the beginnings of an anti-Ebola serum therapy currently in development. These are all achievements that led the jury to award him the prize Christophe Mérieux in 2015 in the amount of 500,000 euros received on Wednesday, June 3, under the dome of the Institut de France in Paris. Patrick Giraudoux, professor of ecology, a senior member of the Institut Universitaire de France, co-founder of the Master ECoS, coordinator of the GDRI EHEDE, and Didier Bompangue, co-founder of the Master ECOM-ALGER, researcher associated with Chrono-environment were invited by Jean-Jacques Muyembe and represented the Chrono-environment lab, the Master EcoS and the GDRI EHEDE.